« Why won’t North Korean trees grow like Kim Jong-un told them to? Pyongyang, September 8 (KCNA) — The Institute of the Commercial Science in the DPRK developed “Sangyon”, an electronic commerce system. The system makes it possible to ensure business through local network with credit card issued by the Central Bank. This 24-hour service system has already been introduced to the West Pyongyang Department Store and many other commercial units, winning popularity among its users. 조선에서 전자상업체계 《상연》이 개발되여 봉사활동에 도입되고있다. 상업과학연구소에서 내놓은 이 체계는 국가콤퓨터망을 통하여 상품소개 및 판매,상업정보소개를 진행하는 전자결제방식의 상업봉사체계이다. 주문,카드를 리용한 전자결제와 송달을 받을수 있게 한다. 손님들의 상품수요를 실시간적으로 장악하여 생산단위들에 맞물려준다. 전국적범위에서 상업발전추세에 맞게 무현금류통을 늘이고 상품구입의 편리성을 도모해주는 전자상업체계는 24시간 봉사하고있다. The Korean report is quite different from the English version. It says that they have developed an e-commerce system called Sangyong 《상연》. On this system, available 24-hours a day no less, companies can list products, provide information, and consumers can actually make purchases for delivery. This system accepts the Jonsong card [《전성》카드] (a pre-pay card issued by the Central Bank in local currency) for payment. It appears that the use of electronic payment cards in North Korea is spreading as North Korea’s central bank releases a new payment card. Photos of the card (called ‘Jonsong’) have been uploaded to social networking sites like Instagram and Facebook by foreigners currently in North Korea. The card is issued by the Central Bank of the Democratic People’s Republic of Korea (hereafter ‘North Korea Central Bank’). Until now, North Korean’s primary credit cards have been the ‘Narae’ card, issued by the North Korea Foreign Trade Bank in 2010, and the ‘Koryo’ card, issued by Koryo Bank in 2011. ‘Narae,’ a foreign currency debit card, can be used at locations like hotels or foreign currency shops after card-owners load it with foreign currency at a bank; the affiliate card ‘Koryo’ can be used when paying for services or products at shops that have a payment system and deal in foreign currency. 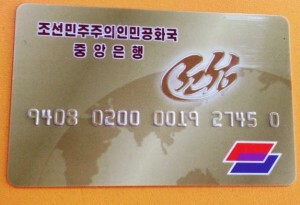 Recently, Yonhap News released a photo of the electronic payment card ‘Sonbong,’ reporting that the card is now in use. The card is issued by the Golden Triangle Bank and can be used in the Rason Special Economic Zone. Both the Sonbong and Narae cards feature a yellow electronic chip on the front of the card. In contrast, North Korea Central Bank’s recently confirmed Chonsong card does not display such a chip and contains a red and blue diamond-shaped design in the lower right-hand corner. It is estimated that approximately 4 billion dollars are circulated and held privately by North Korean citizens. As a step to legalize that currency, it is widely known that North Korea implemented the ‘cooperative currency system’ (effective March 1, 2013), inducing individuals and agencies to open and use foreign currency accounts and actively encouraging the use of cards. These days, foreigners visiting North Korea pay for hotel rooms, taxi fares, and other products with the Narae card after charging it with foreign currency. This entry was posted on Tuesday, September 8th, 2015 at 1:41 pm and is filed under Banking, Central Bank, Finance, Fiscal & monetary policy. You can follow any responses to this entry through the RSS 2.0 feed. Both comments and pings are currently closed.